As part of the first Glasgow International Festival, a multi-venue showcase for domestic and international art, the Centre for Contemporary Arts (CCA) hosted Risk. An ambitious attempt to “bring together artists who endeavor to make creative political change through their practice,” Risk featured artists, activists, and cultural workers, including the Rebel Clown Army, Variant magazine, Doug Aubrey, Gregory Green and the Atlas Group. On entering the gallery’s foyer the viewer was greeted by an onslaught of textual messages. Mel Jordan and Andy Hewitt’s stark black and white text — “The economic function of public art is to increase the value of private property” — confronted the Self Regulating Poster Wall, a sprawling mass of posters pinned up and “managed” by members of the public. Hewitt and Jordan’s work was a succinct reminder of the use of culture as a dubious tool in social and cultural redevelopment, while the poster wall was, as you’d expect, a jumble of contradictory messages — a space where the political was accosted by the humorous, irreverent and bizarre. In relation to the Scottish culture industry, Jordan and Hewitt’s work was highly apt, but would have benefited greatly from being publicly situated; gallery presentation rather neutered their message. The Poster Wall may have been motivated by a genuine desire to produce an “interactive” democratic work, but like so many wellintentioned projects, it felt rather tokenistic. It might have been more original, for instance, to have invited activists such as the Scottish Palestine Solidarity Campaign who frequently petition on the same street as the CCA to contribute to the exhibition. But though inviting activists to work within and on the structures of the gallery might have produced a more engaged and “riskier” show, my suspicion is that this would have politicized Risk in a manner that the gallery and curators would have been uncomfortable with, crossing as it would have the line between detached documentation and partisan practice. The preponderance of video, text, and pared-down photographic work was immediately noticeable in the main gallery. Formally, Risk was a pretty dull exhibition. 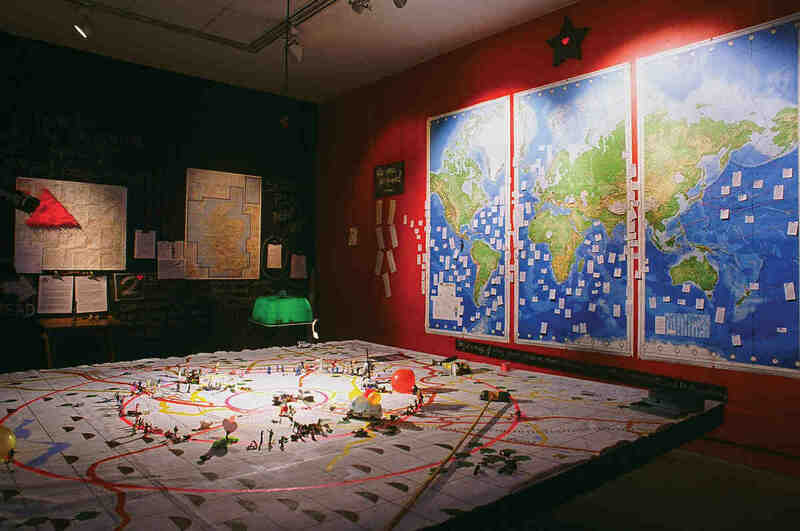 The visual imagery included was mainly utilitarian and largely supplemented by text — the Critical Art Ensemble’s large mock ads for genetically modified produce, for example, or Martin Krenn’s plain photographic city views. The volume of text, video, interactive computer programs, magazines and books indicated that most participants in the show consider text, rather than image, to be the best means of communicating a message. From Josh On’s They Rule maps detailing the interconnected web of the board member elite in corporate America, to Kate Rich’s Feral Trade Coffee Shipment, documenting an experiment in using social and cultural networks to establish alternative trade routes, Risk emphasized largely purging the work of visual detail — the legacy of conceptualism hung heavily. Few would question the commitment or critical accuracy of artists such as Jacqueline Salloum, whose video Planet of the Arabs, a collage of Hollywood’s vilification of Arabs in cinema, was a sharp exposure of the western media’s racism. I wondered about the artistic and political efficacy of this kind of work both within the context of the gallery and, more importantly, in the outside world. Writing in the 1930s, Bertolt Brecht noted that one of the chief tasks of the politically engaged artist was to acknowledge that “new problems appear and demand new methods. Reality changes; in order to represent it, modes of representation must also change.” For many of the Risk artists, it was precisely a lack of innovation or self-reflexivity regarding form that made their work seem aesthetically and conceptually narrow. The intentions were undoubtedly honorable, but the execution was academic and safe.